As the university begins to roll out its external communications initiative across the country, a series of town hall meetings are being held to share the process and showcase the elements of the effort. Tim Clevenger, associate vice president for communications, marketing and brand management, spoke to a group of Eugene-area marketing professionals recently, outlining the evolution that led to the new creative work. The process began by asking a steering committee made up of a wide range of campus constituents to synthesize a number of different studies performed since the 1990s. Through those studies, a set of themes were identified, which gave way to a full discovery process, strategy development and ultimately a new look and feel to the university’s many communications tools. Hundreds of UO faculty, staff, students and alumni were involved along the way. Among the many interesting takeaways from the research: The Duck isn’t just an athletics icon. “The Duck overwhelmingly represents community, according to a student study conducted by College of Arts and Sciences,” Clevenger said. And it appears to be working. UO Web traffic is up eightfold from this time period last year, and the number of visitors checking out ‘Academics’ and ‘Research’ has more than doubled. The communication effort capitalizes on the university’s location, people and the idea that “Ducks are a curious lot,” Clevenger noted, and is designed to reward curiosity. 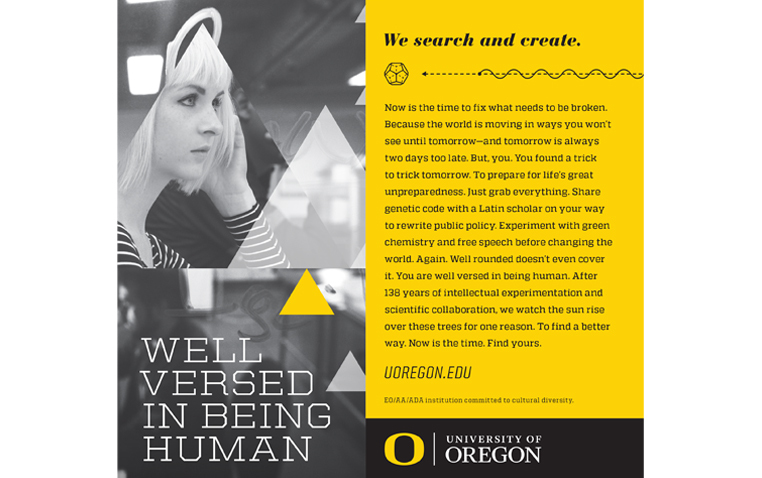 Sharing the 90-second version of the university’s new television commercial, he directed the audience to visit http://exploreif.uoregon.edu/, where the commercial’s numerous elements can be examined in detail. The event was the third in a series of gatherings where the effort was shared to hundreds of students, faculty, staff and alumni. The gatherings of the UO community will continue periodically for the duration of the four-year effort. The next town hall will take place in Portland from noon to 1:30 p.m. Thursday, Jan. 29, at the White Stag Building, Room 142. Contact Heidi Hiaasen at heidih@uoregon.edu to RSVP. “This is our chance to show the full story of the ‘O,’” Clevenger said.